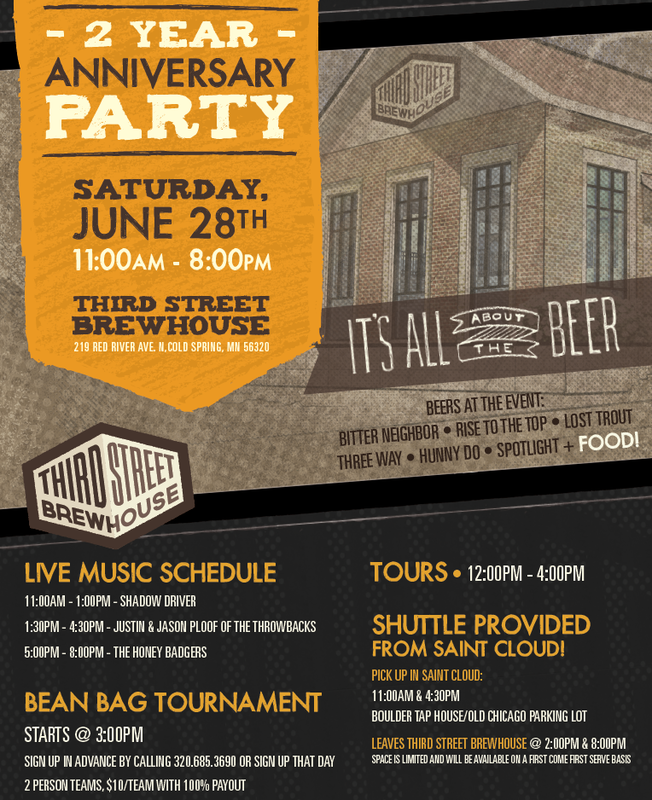 Third Street Brewhouse celebrates their 2-year anniversary today with music, food, games, and tours of the facility. Music performances from Shadow Driver, Justin + Jason Ploof of The Throwbacks, and The Honey Badgers. Beers will include Bitter Neighbor, Rise to the Top, Lost Trout, Hunny Do, Three Way, and the new Spotlight IPA. The bags tournament starts at 4pm, and there will be tours from 12-4pm. The good people at Third Street have a lot to celebrate. In two years they have built an incredibly large and sophisticated facility, launched successful brand, and expanded at an impressive rate. In 2013 Third Street Brewhouse produced 86,000 barrels of craft beer. That puts them at #3 in the state (coincidence?) behind big guys Summit and Schells. This year Third Street began packaging in cans, and debuted their Spotlight IPA.